If you look at my pictures growing up, I used to look like an Army cadet. My dada��s concept was very clear: when you get up, you dona��t fuss over yourself. And he liked it that way.a�? This worked well, till the family was posted to Hyderabad, and Rajia��s dad a�?suddenly discovered he had four teenage daughters, not jawansa�?. Dad hastily decreed they had to put flowers in their hair and wear half-saris. This was met with stiff resistance from the girls and their mother, and a bipolar armistice ensued in their dress sense. 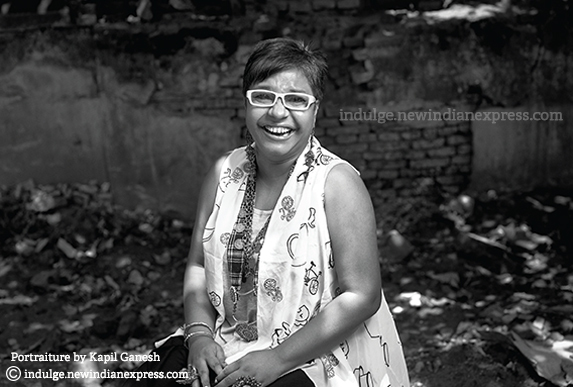 As a young adult, Raji started sharing her elder sistera��s interest in design, who, at the time, was a student at NIFT. Soon after, Raji would help pick out glammed up stage looks for her younger sister who was on her way to becoming a professional singer. For herself, despite changing fashions, the principle remained the same: neat, well cut and well made clothes. In one of her earlier avatars as a casting director, she realised the importance of turning herself out well, but always only as a prop to a well-centered personality. This is important to hera�� without the personality, appearance alone wona��t stand. At some point, pressure to marry resulted in the giddy ritual whirl of a�?seeing boysa�?, which Raji enjoyed tremendously, being clear right through the process that she had little intention of settling down. Her summation of the period is matter-of-fact: a�?I would go, meet new guys, chat with the family, eat well, come home and say no.a�? Always considered the good girl in the family, this one area was something of an issue for her hapless parents. She shows me a photograph that her father circulated to her prospective suitors: she wears an orange sari, peeks demurely into the lens, every bit the pretty blushing bride, but with an explosion of bright orange hair (that matches the sari), a startling overall visual a�� in an unfortunate hair experiment the night before, that involved too much bleach and too much time with it left on, the resultant hair colour nearly made her mother faint. The experiment was compounded by the fact that the next day a photographer had been summoned to take photos of the prospective bride for circulation to potential groomsa�� families. Raji believes that till today, that photo causes involuntary shudders wherever it reached.One lucky boy took the bait though, and Raji got married, her hair happily bleach-free since. Through it all, Rajia��s instantly likeable nature and distinctive appearance (almost always headlined by her accessories and ensemble coordinated eyewear) can be summed up in a single word: positivity.